All Saints today in Spain…let’s celebrate! Why not settled down in a plaza in Ayamonte and enjoy a cake and coffee. At less than 3 euors for both its a cheap afternoon in the sunshine. Beats Halloween any day! Try this recipe for a lovely Spanish summer soup. Originally shared by +Lecrín Valley Villa Rental Granada Spain. Everyone has heard of Gazpacho, the refreshing and nourishing Spanish cold soup, ideal for the summer. With the high temperatures here in Andalucia, I thought I’d just reshare this post with you. This is a recipe for you to follow. 1 green, Italian type pepper. 1 cucumber of about 250 gr. 4 tablespoons of white wine vinegar. Wash and peel the tomatoes, cut into four pieces and put them in the blender. Wash the cucumber and cut into pieces. Wash the pepper remove the seeds and cut into pieces. Peel the garlic, cut in half and remove the central stem so that the gazpacho doesn’t repeat on us. Take the peeled piece of onion and add along with the cucumber, pepper and garlic. Put everything together with the tomato that we already have in the blender. Blend all the vegetables, add a teaspoon of salt, the extra virgin olive oil and the vinegar. Taste and rectify salt or vinegar if needed. Continue blending into a smooth cream. Depending on the type of tomato and depending on the taste of each one, we can add a little cold water or not, to obtain a thicker or thinner consistency. Put in the refrigerator for 2-3 hours before serving. Accompany with bits of cucumber, pepper and onion. And you can also add a few small pieces of Apple (optional). Bob’s your uncle – Gazpacho Andaluz! ¡Buen provecho, amigos! I love this photo taken this evening by the talented @tognomendez. You can see my location to the far right of the photo. You can spot the pool all light up. Have you spotted us yet? This pictures captures why I love our apartment at Isla Canela SO much. You can see the Guardiana river running down to the Ocean and the lights twinkling across the water from Portugal. It’s a fab view from our terrace too. Casa Tagomago and Isla Canela would make a great base for discovering Andalucia. Many of our guests who visit Casa Tagomago in the Lecrín Valley, do so as part of a roadtrip through Andalucia or even round the whole of Spain. I have sometimes been asked for advice or suggestions on places to stop at. 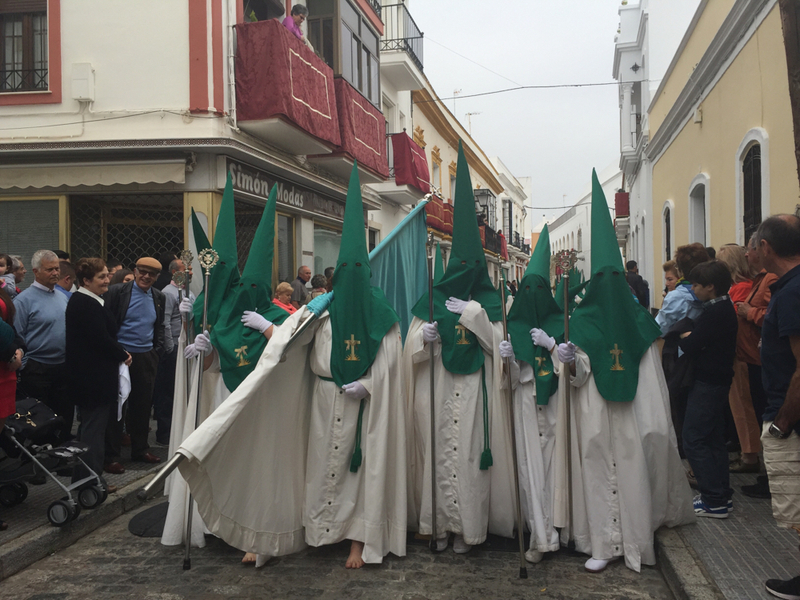 This wonderful video from +Spain-holiday.com has inspired me to suggest that one of the stages of an Andalucian roadtrip could coincide with this amazing and traditional event in El Rocio, Almonte, Huelva. The Saca de las Yeguas (Taking out of the Mares) is an age old tradition celebrated as part of the festivities for Saint Peter, patron saint of El Rocio, and the old livestock market. Regulated as far back as 1509 by the Duke of Medina Sidonia nobody quite knows when this event actually started. The people of Almonte go off into the marshes to collect the wild mares that graze all year in different areas of the National Park of Doñana. On 26th. June the herd of mares runs through the streets of El Rocío up to the doors of the church, to be blessed by the priest. A foal is offered to the Virgin of Rocío by the Livestock Association of the Marshes. The rest of the herd continues on to Almonte where they are cleaned and re shoed and the foals are put up for sale. The animals that aren't sold are returned to the marshes of Doñana to live in liberty for the rest of the year. Watching the video one can almost imagine it taking place in the Far West but no it's Andalucia in 2015 and is a beautiful tribute to ancient traditions and to the men, women and animals that strive to keep such wonders alive. Enjoy! More suggestions for that Andalucian roadtrip in future posts. Keep the kids busy this summer with this great activity camp at Punta del Moral. It’s 15 euros a day or 50 euros for 4 days. The camp is located near the marina. Looks good fun! How about joining a moonlight walk? There are three dates so far. Sounds fab!